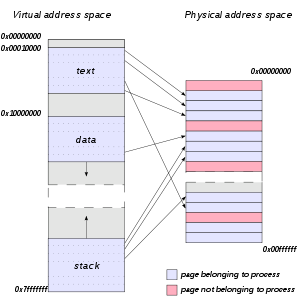 Relationship between pages addressed by virtual addresses and the frames in physical memory, within a simple address space scheme. Physical memory can contain pages belonging to many processes. Pages can be paged to disk if used infrequently, or if physical memory is full. Not all pages are in physical memory in the above diagram. ^ Home — Memory Management Reference 4.0 documentation. www.memorymanagement.org. [2018-08-15].